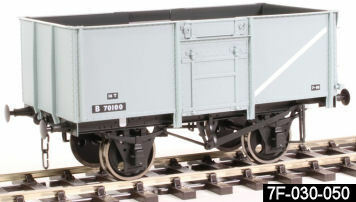 Dapol are reproducing the Lionheart superb quality BR 16ton mineral wagonsready-to-run wagons, fully finished and complete with metal wheels, sprung couplings and sprung buffers. They hope to have these out before Easter 2018 and we are taking advance orders for these now for despatch as soon as they become available. The images sown are of the previously produced Lionheart examples to give an idea of the liveries and finish and are not the specific numbers that dapol will be producing. 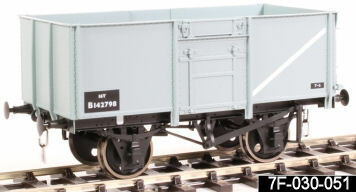 British Railways standardised on the 16 Ton mineral wagon and constructed nearly 240,000 wagons between 1950 and 1959. The main use was for shipping of coal although sugar beet, scrap metal, spoil and aggregates were also carried. The majority (approximately 197,000) were constructed to Diagram 1/108. These had welded bodies with top flap doors, and apart from 10,000 all had one-sided Morton brake rigging. Diagram 1/109 had rivetted bodies. For further historical information please see the three articles by Peter Fidczuk in Modellers' Back Track volume 1, numbers 3 to 5. 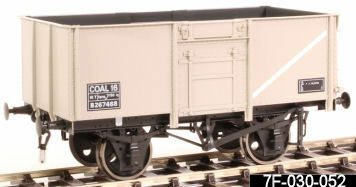 All our models are built to a ratio of 1:43.5, 7mm scale and fitted with finescale wheels for '0' gauge track.